Within the European Union, the abolition of internal borders between member countries, and creation of a common market has led to a great increase in mobility – both for passenger traffic and for freight. However, this increase in mobility has also led to problems in transportation – increased traffic congestion, longer commute times and more air pollution. ‘Europe at Crossroads’, published by the European Commission, estimates that over 7,500km of highways in Europe are blocked every day by traffic jams, while congestion on roads and airports increases the European Union (EU) nations’ fuel bill by about six percent every year. A need has been felt, therefore, for a collective and concerted remedial effort to address the issue. An example of such an initiative is the Archimedes Project under the EU CIVITAS programme. Archimedes is a demonstration project spanning six cities of the EU. It aims at creating sustainable transport systems which are safe, environment friendly and energy-efficient. The project was initiated in 2008 and will continue till 2012. 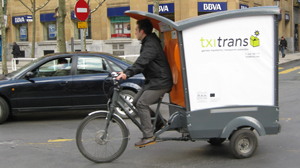 The measures introduced as a part of the Archimedes project include promoting alternative fuels, clean vehicles and public transport, inter-modal integration, demand management, influencing travel behaviour, innovative mobility services, energy-efficient freight logistics and traffic safety. The six cities involved in the project are Aalborg, Brighton & Hove, Donostia-San Sebastián, Iaşi, Monza, and Ústí nad Labem. Aalborg, the fourth largest populous city in Denmark, is an industrial and educational hub. Brighton & Hove is one of the largest seaside resorts in southern England. Donostia-San Sebastián is the capital of the province of Gipuzoka on the southern coast of Spain. Iaşi is the second largest city in Romania while Monza, near Milan, is an important city in the Lombardia region of Italy. Ústí nad Labem is located in north-west Bohemia, in the Czech Republic. Traditionally, in Europe, diesel has been used as fuel for public transport vehicles. Since the last decade however, environmental concerns, such as air pollution caused by combustion of diesel, have spurred the search for alternative fuels. 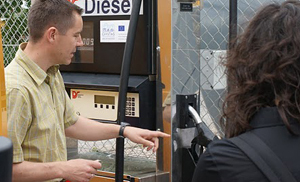 One of the alternatives in use at present in the EU is bio-diesel. Bio-diesel contains less carbon, but higher hydrogen and oxygen content than conventional diesel. Due to this, it is considerably less polluting than diesel, as it produces lower amounts of CO2 and particulate matter on combustion. Both first generation and second-generation bio-diesels are in use in EU. As against the conventional fossil fuels like diesel, the second-generation bio-fuels such as second-generation bio-diesel reduce CO2 emissions by about 90%. Comparatively, first generation bio-fuels achieve a 70% reduction. Second-generation bio-fuels are produced from non-edible portions of plants such as straw and husk, non-food crops, used cooking oils and animal waste, whereas first generation bio-fuels are sourced from mainly edible oils such as soybean, corn and sunflower oil. Thus, a huge demand for first generation bio-fuels would push up food prices quite high, which would be disastrous. Second-generation bio-fuels do not present this problem. In Aalborg, in October 2010, the city and Aalborg’s Archimedes project partners Aalborg Kommune and Nordjyllands Trafikselskab (the public transport company in Northern Denmark) launched fifty buses running on B10 (bio-diesel mix with a blend of 10% second-generation bio-diesel and 90% conventional diesel) in their fuel mix. The Danish Postal Service Post Danmark A/S has 50 vehicles running on B20. The introduction of second-generation bio-diesel has lowered carbon emissions in Aalborg by about 140 tonnes a year, roughly equal to emissions by about 55 cars. Currently, the city has eight buses running on B50, and is also testing B100 –100% bio-diesel without addition of conventional diesel. 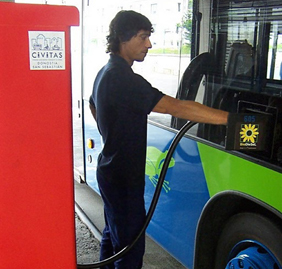 In Donostia-San Sebastián, the public transport company CTSS DBUS (Compañía del Tranvía de San Sebastián DBUS) has set up an innovative bio-diesel filling station. The bio-diesel used at the station is produced from used cooking oils. Standard diesel and bio diesel are stored in separate tanks at the filling station. The bio-diesel fuel mix can be programmed for each bus, making the system ideal for bus fleets which have different types of bus engines requiring different proportions of mixes for different vehicles. As of today, 84 buses are running on B30, four buses on B80 while the rest are running on B50. Iaşi has been using bio-methane, a second-generation bio-fuel, in public transport buses under Archimedes. The gas is produced from decomposing urban waste in a landfill, and is collected using a recovery unit and liquefying equipment. Thus, the initiative serves two purposes – it not only disposes off urban waste but also produces energy for public transport without carbon emission. The city is in the process of modifying 30 of its buses to run on bio-methane. The city is also in the process of converting another 30 buses to run on Liquefied Petroleum Gas (LPG). LPG, though not a bio-fuel, is considerably less polluting than conventional diesel and petrol, giving off less particulate matter and smoke as it burns. Till now about 29 of the 30 buses have been converted to run on LPG. The process is expected to be completed by February 2012. The Technical University of Iaşi (TUI) is conducting research to study the effect of bio-methane in public transport and also on the air quality. The Archimedes project will fund a part of the study. Under Project Archimedes, hybrid and electric vehicles have been tested with a great degree of success. Hybrid vehicles have been considered a sound alternative to diesel powered vehicles as they rely less on scarce and increasingly expensive fossil fuels, and at the same time are far less polluting. In Aalborg, a new shuttle bus service was launched in June 2010 operating one hybrid bus – a Volvo 770 diesel-electric hybrid bus running both on diesel and electric power. The bus route was in operation through the summer of the year, until August 2010, showcasing the advantages of hybrid buses. By January 1, 2011 three more such buses were introduced. The buses use regenerative braking to store the energy dissipated during braking in high value capacitors. This energy is later used to power the electric motor of the bus which, in turn, gives an overall savings of 35% in fuel consumption. The electric engine of the bus can be charged both during the day as well as at night. Donostia-San Sebastián tested the IDEAS 2 series hybrid bus in November 2010 which is manufactured by leading German commercial vehicle maker Man Truck and Bus AG. An upgraded version of this bus has been inducted into the public transport system in July 2011. The bus saves up to 25% in fuel consumption while complying with EEV (Enhanced Environmentally friendly Vehicle) standards, resulting in an annual reduction of CO2 emission by about 26.5 tonnes. It has regenerative braking and an automatic start and stop feature to save fuel consumption and reduce emissions.